Like everyone else, elite investors make mistakes. Some of their top consensus picks, such as Amazon, Facebook and Alibaba, have not done well in October due to various reasons. Nevertheless, the data show elite investors’ consensus picks have done well on average over the long-term. The top 30 S&P 500 stocks among hedge funds at the end of September 2018 returned an average of 6.7% through November 15th whereas the S&P 500 Index ETF gained only 2.6% during the same period. Because their consensus picks have done well, we pay attention to what elite funds think before doing extensive research on a stock. In this article, we take a closer look at Flex Ltd. (NASDAQ:FLEX) from the perspective of those elite funds. The number of hedge fund shareholders of Flex Ltd. (NASDAQ:FLEX) dipped by 13% during Q3 after gaining ground over each of the prior 3 quarters. FLEX shares have imploded by over 50% in 2018, which prompted one of The 25 Biggest Insider Purchases in October by Flex EVP, General Counsel David Scott Offer, who bought just over 27,000 shares at the end of October. Jay Petschek and Steven Major’s Corsair Capital Management was very bullish on Flex in its Q2 investor letter, believing shares could hit $25 within 1-2 years. However it should be noted that since the publication of that letter, Flex and Nike Inc (NYSE:NKE) announced that their footwear manufacturing facility in Mexico would be closed due to being economically unviable. “FLEX Ltd. (“FLEX”), an outsourced manufacturing solutions company servicing a diversified set of industries, declined 14% during the second quarter. The company reported an earnings miss for fiscal Q4 2018, caused by elevated start-up costs for new contracts that haven’t begun to produce profits as yet. The most notable of these ramping contracts is with Nike (“NKE”), which management expected to be breakeven by the end of the quarter and disappointed the Street by failing to achieve that. Our thesis in owning FLEX is based on the idea that this is a materially better business than its trading multiple implies and that ramping revenue and earnings could drive the stock as high as $25 per share over the next 1-2 years. While reported EBITDA margins appear to be in the mid-single digits, we believe real EBITDA margins are closer to 20%, as 75%-80% of the company’s revenues are contractual pass-throughs to cover raw material purchases by FLEX. In reality, FLEX’s clients are paying high margins to the company to provide value-add proprietary manufacturing technology solutions, and we believe the stock deserves a 15x multiple on earnings of over $1.70 per share when the Nike contract inflects to profitability. FLEX closed the quarter at $14.11,” Corsair Capital Management wrote in its Q2 letter. 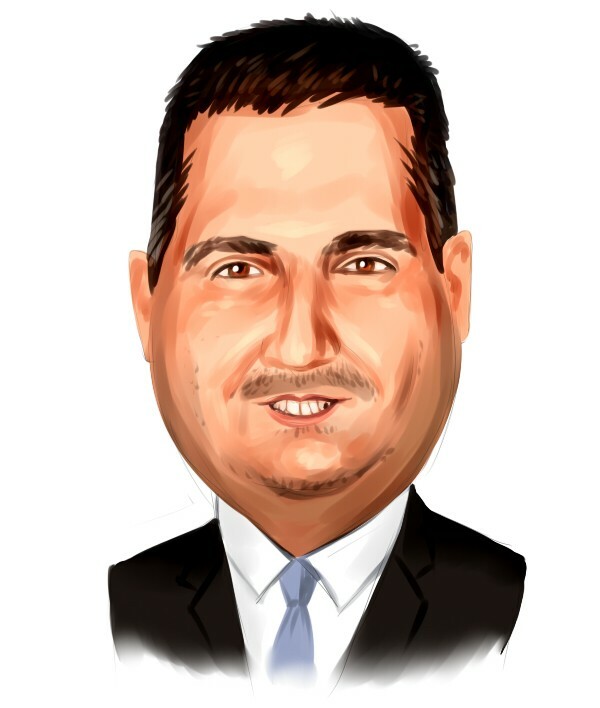 How are hedge funds trading Flex Ltd. (NASDAQ:FLEX)? At Q3’s end, a total of 26 of the hedge funds tracked by Insider Monkey were bullish on this stock, a 13% decline from the previous quarter. 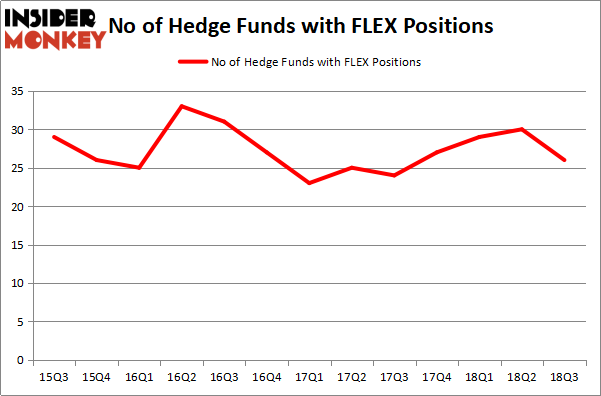 The graph below displays the number of hedge funds with bullish position in FLEX over the last 13 quarters. So, let’s check out which hedge funds were among the top holders of the stock and which hedge funds were making big moves. Among these funds, Glenview Capital held the most valuable stake in Flex Ltd. (NASDAQ:FLEX), which was worth $231 million at the end of the third quarter. On the second spot was Citadel Investment Group which amassed $167.2 million worth of shares. Moreover, AQR Capital Management, D E Shaw, and Pzena Investment Management were also bullish on Flex Ltd. (NASDAQ:FLEX), allocating a large percentage of their portfolios to this stock. Judging by the fact that Flex Ltd. (NASDAQ:FLEX) has faced bearish sentiment from the smart money, we can see that there was a specific group of fund managers who were dropping their entire stakes by the end of the third quarter. It’s worth mentioning that Joshua Kaufman and Craig Nerenberg’s Brenner West Capital Partners dumped the biggest investment of the “upper crust” of funds followed by Insider Monkey, valued at an estimated $24.6 million in stock. Thomas E. Claugus’ fund, GMT Capital, also dumped its stock, about $17.1 million worth. These moves are interesting, as total hedge fund interest fell by 4 funds by the end of the third quarter. Let’s also examine hedge fund activity in other stocks – not necessarily in the same industry as Flex Ltd. (NASDAQ:FLEX) but similarly valued. These stocks are Chemours Co (NYSE:CC), Apartment Investment and Management Co. (NYSE:AIV), Teradyne, Inc. (NYSE:TER), and W.P. Carey Inc. REIT (NYSE:WPC). This group of stocks’ market values match FLEX’s market value. As you can see these stocks had an average of 21 hedge funds with bullish positions and the average amount invested in these stocks was $495 million. That figure was $935 million in FLEX’s case. Chemours Co (NYSE:CC) is the most popular stock in this table. On the other hand W.P. Carey Inc. REIT (NYSE:WPC) is the least popular one with only 10 bullish hedge fund positions. Flex Ltd. (NASDAQ:FLEX) is not the most popular stock in this group but hedge fund interest is still above average. This is a slightly positive signal but we’d rather spend our time researching popular stocks that hedge funds aren’t selling off, like CC.